Add an extra crunch to your zoodles with Chedz crumbs sprinkled on top or mixed in. This is a simple, 10-minute recipe that you can easily adapt with other ingredients to your taste. Keep it entirely gluten-free with our gluten-free Chedz! 2 Zuchinnis If store bought; 1 package of zuchinni veggie spirals. We use 2 zuchinnis with a spiralizer. If you are making your own zoodles: 1. 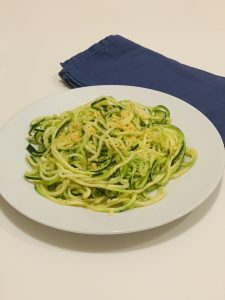 After spiralizing the zuchinnis, place zoodles in a collander over a large bowl. Sprinkle the zoodles with salt and let it sit for 30 minutes to allow the salt to draw out water. 2. 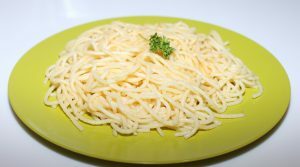 Once zoodles are squeezed, dab them with paper towels if needed and set them on paper towels while you prepare the sauce. If you are using a frozen package of zoodles, steam frozen zucchini noodles over medium heat until al dente, about 5 minutes. Remove to a colander and drain well. Crush 1-2 ounces of Chedz to resemble crumbs by using a rolling pin, food processor or Magic Bullet. Set aside. Add olive oil to warm skillet. Sauté garlic until fragrant, about one minute being careful not to burn it. Add in drained zucchini and toss to coat. Season well with salt and pepper to taste. Add crushed red pepper flakes if using. Sprinkle in grated parmesan cheese if desired. Add Chedz crumbs and stir. 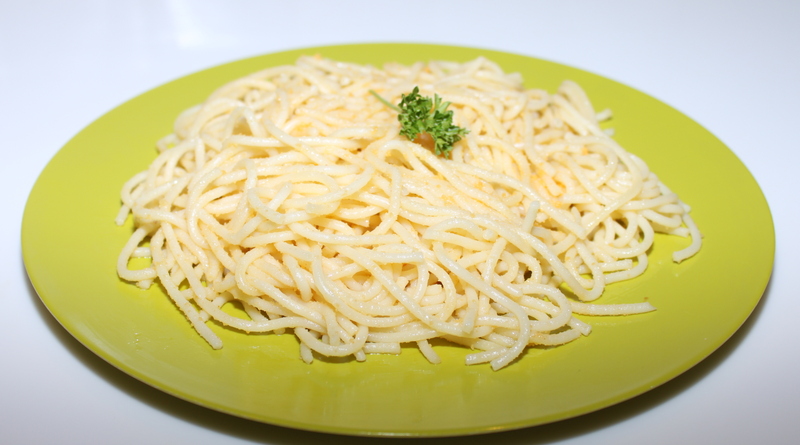 Alternatively, you can serve the zoodles on a plate and add Chedz crumbs on top. Mixing in the Chedz crumbs wil result in softer crumbs. Other ingredient options: tomatoes, parsley, bell peppers, mushrooms, onions. Throw in your favorite vegetables! ENJOY! Bring a large pot of water to a boil. Add 2 tablespoons of salt and the pasta and cook according to package directions. Drain and add to a large pasta bowl. Pour 1/3 cup of olive oil in a pan. Add a dash of salt. Add 6-8 garlic cloves. Simmer on low for about 20 minutes and watch carefully so garlic does not burn. Stir garlic periodically. Crush Chedz to crumbs consistency using rolling pin or food processor. Mince the fresh parsley if using. Add crushed red pepper flakes to the olive oil. After about 20 minutes, turn off burner and pour the olive oil over the pasta. You can leave the garlic slivers in the pan or choose to add it to the pasta. Add Chedz crumbs and parsley (if using) and stir. Serve and enjoy!